No, I'm not. After all these years and maybe many requests by fans. 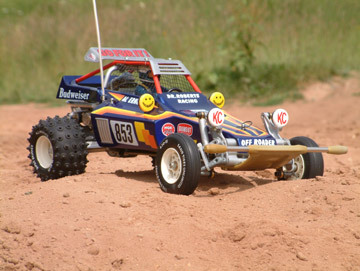 Tamiya have released both the Rough Rider (Buggy Champ) and Sand Scorcher!! 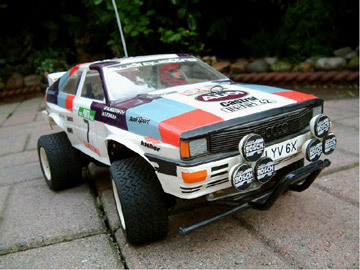 To celebrate a milestone of 30 years R/C. It might not please everyone, but it's still very hard NOT to get excited about it! 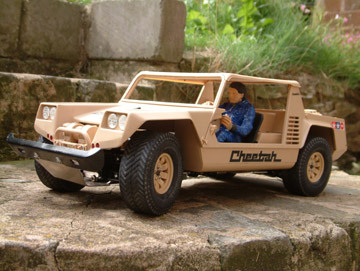 Seeing as I am a lucky bloke (or jammy) to own an original NIB Scorcher. I thought it would make a great article on the differences between the kits, old vs new..
Before we start. In nearly every picture you see on the right, the original kit/parts are on the left and the re-release on the right. First up, the re-release box is bigger!.. About 10mm deeper, which means the box inserts are deeper too..
And although keeping with the same layout, all the box artwork has been updated and a few things added and taken away..
On opening the box's, you notice straight away everything inside is nearly the same.. Or is it?... The packaging is all slightly different bringing it up to date. The obvious things changed are the manual and decals.. Some of the not so obvious alterations are hidden away in the contents. I'll try and go through everything I've found so far.. The body is the main item updated/altered. Or should I say copied? As it's exactly the same body as the Blitzer Beetle, only moulded in white and not black. However, all the Blitzer mounting holes have been filled in and the new front and rear mounting holes drilled, along with holes for the new (awful!) mirrors. Oh and the moulded stamp inside has been altered.. Along with many tiny parts alterations and plastic trees different.. We have the infamous glass three the same, but moulded in a harder, clearer plastic.. The radio mechanism box is very different in colour too..
Back to the body parts and the nose cone tree is exactly the same as the original Scorcher too (thank the lord!) These were impossible to find new before the re-re. But, the driver tree stays the same as the Monster Beetle, with flat number plates and complete moulded rear lights, although you do get the glass rear lights still on the glass window tree? Yes, many changes indeed and the prices of vintage parts/kits will obviously be effected unfortunately. But, and this is a big BUT! It's still magical to open a NEW Sand Scorcher kit in all it's glory. And you can dive in and enjoy building it without any worries what so ever! Then go out and thrash it within an inch of it's life! 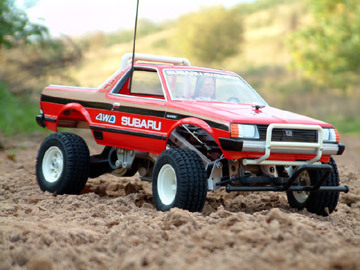 Thanks yet again Tamiya. What's next we wonder? Also, checkout our updated Beetle shell comparison. 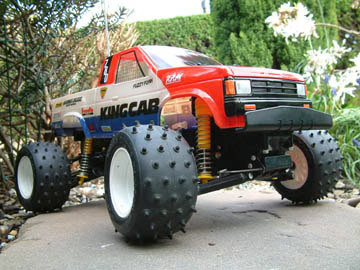 Now that we have the fourth Beetle shell from Tamiya..